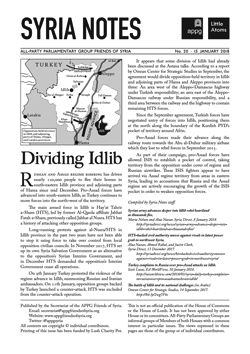 Our latest issue looks at recent events in Idlib province, the ongoing siege of Eastern Ghouta in the suburbs of Damascus, and wider humanitarian access issues. In recent weeks and months, the so-called de-escalation zones in Idlib and Eastern Ghouta have become scenes of escalating air attacks on civilians by Assad regime and Russian forces, and of ground fighting between Assad regime and various opposition forces. At the same time within Idlib province there is an ongoing political and military conflict between jihadists and opposition institutions and organisations.